Footage from a visitor at the zoo clearly shows the cats relaxing with the bear, unconcerned at the enormous beast marching around the rather tiny enclosure. The polar bear has no natural predators in the wild, but the cats were unperturbed. Reports suggest the animals are friends and a special bond has grown between them. But reports claim witnesses speculated the bear did not go for the cats because it was well fed and had a unique bond with the small animals. Polar bears live in the circumpolar north in areas where they can hunt their primary prey, ice seals. They are found in Canada (home to roughly 60% of the world's polar bears), the U.S. (Alaska), Greenland, Russia, and Norway (the Svalbard archipelago). 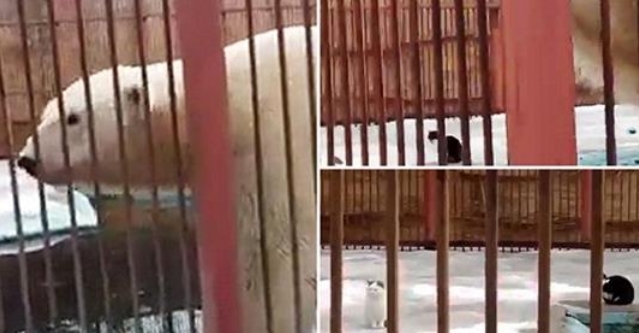 Responses to "Lonely Polar Bear Befriends Three Stray Cats At A Zoo "
This is disgusting! What a horrible life for the polar bear, why?